Winter officially abandoned the little hide and seek game it’s been playing and is here with a vengeance. Of course, New Englanders are a hearty bunch, and life goes on, texts must be sent, statuses must be updated, and letter tiles must make points. 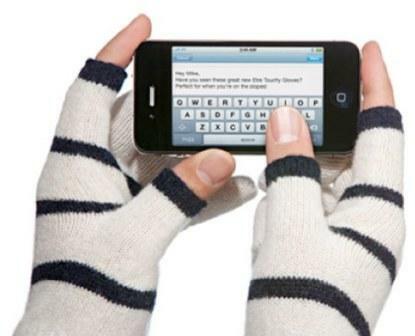 iPhone addicts, meet your new best friend: touchscreen gloves. 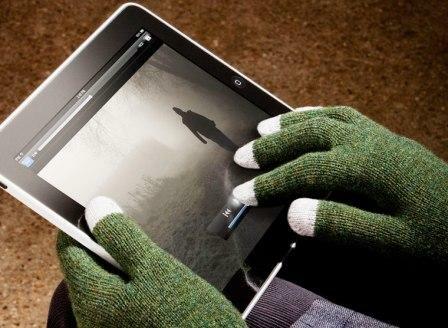 There are a number on the market but since the temperature dropped I’ve been using Etre “touchy gloves,” which are warm and snuggly but have missing thumb and index fingertips, so I’m free to work, email, text, Tweet, download, shop and everything else on my Smartphone. Even better, they’re slim and fitted while fashionable (mine: Oxford blue with pearl grey tips) and functional (warm wool!). I’ve also tried the Etre FIVEPOINT gloves, which are sans cut-outs but still have touchscreen compatibility. How? Their specially-designed contactwoven® fingertips conduct electricity so you can work while being warm uninterrupted. (GQ called the men’s collection “stylish and manly” in the December issue). Etre is a London-based design agency that specializes in “making things more people friendly,” but in a refreshing, stylish way. The gloves come in a host of patterns for both men and women; are effective on mobile phones, smartphones, iPods, iPads, tablets, cameras and other electronic devices; and start at £35.00 GBP (That’s about $53.59 here across the pond…). Click here to check out the Etre online shop for more info, styles, and to order. Thank you to Etre for letting me try the gloves! Though supplied with a sample pair of each, my opinions on them are independent. Entry filed under: Uncategorized. Tags: Etre FIVEPOINT gloves, Etre FIVEPOINT gloves reviews. Etre FIVEPOINT gloves imaes, Etre FIVEPOINT gloves sale, Etre FIVEPOINT gloves USA, Etre touchy gloves, Etre touchy gloves images, Etre touchy gloves reviews, Etre touchy gloves sale, Etre touchy gloves UK, Etre touchy gloves USA. Inspired by Celeb Style: Fabulous & Flattering Winter Outerwear and Accessories	Fashionable Frugalistas! Fab Deals for Men and Women at Rib & Rhein, Island Outfitters, Laura Jean and More on Deck!